Engineers at the Massachusetts Institute of Technology (MIT) have claimed that new commercially-available superconductors could enable them to build an operational nuclear fusion reactor in as little as ten years. Known as an ARC reactor, this would be a small version of the toroidal tokomak reactor type, similar to the large reactor currently being built by international fusion project Iter in southern France. The ARC reactor — the acronym stands for affordable, robust, compact; although it probably owes something to the fictional power reactor in the Iron Man superhero films and comics — uses rare-earth barium copper oxide (REBCO) tapes to form its magnets. These are claimed to produce a stronger magnetic field than the superconductors used in other tokomak designs (Iter, designed before REBCO became available, uses two superconductors, niobium-tin and niobium-titanium), which in turn means that the fusion reactor can be smaller, about half the size of Iter’s 6m diameter: this means it would also be cheaper and quicker to build. REBCO becomes superconducting at temperatures of around 90-100K, rather than the 4K critical temperature of Iter’s magnets; this means that cooling can be achieved with liquid neon, hydrogen or even nitrogen rather than liquid helium, making cryogenics simpler and cheaper. The design, which was the result of a student design project following on from a reactor design course led by Dennis Whyte, director of MIT’s plasma science and fusion centre, features a few refinements to the Iter-type design. These are described in a paper co-written by Whyte, PhD student Brandon Sorbom and colleagues in the journal Fusion Engineering and Design. 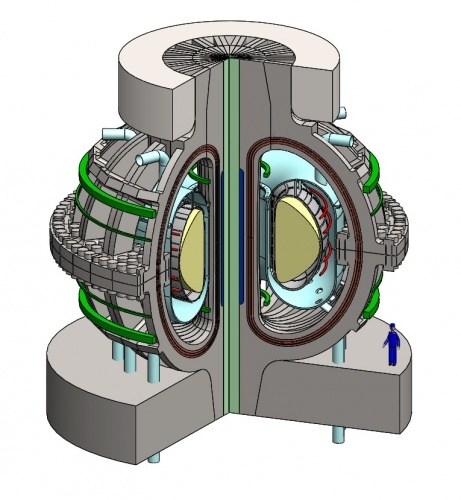 Specially-designed joints in the magnets allow the core of the tokamak, the toroidal vacuum vessel, to be removable without the need for dismantling the entire device, making it very suitable for research and systems optimisation. The ‘blanket’ of the device, the component which faces the hot fusion plasma while also capturing the fast neutrons generated by the fusion process (which both allows the heat to be recovered from the reaction and also generates the radioactive isotope of hydrogen, tritium, which is one of the raw materials for fusion), is not a series of solid blocks as it is in Iter. Instead, it’s composed of a molten salt known as FLiBe (a mixture of lithium and beryllium fluoride) which is circulated slowly and continuously around the inner walls of the torus at a temperature of about 900K. FLiBe is a proposed solvent for use in liquid fluoride thorium reactors — fission reactors that run on thorium fuel rather than uranium — and there is a large body of research on its properties and industrial use. This is also easy to replace, Whyte said, making maintenance easier. 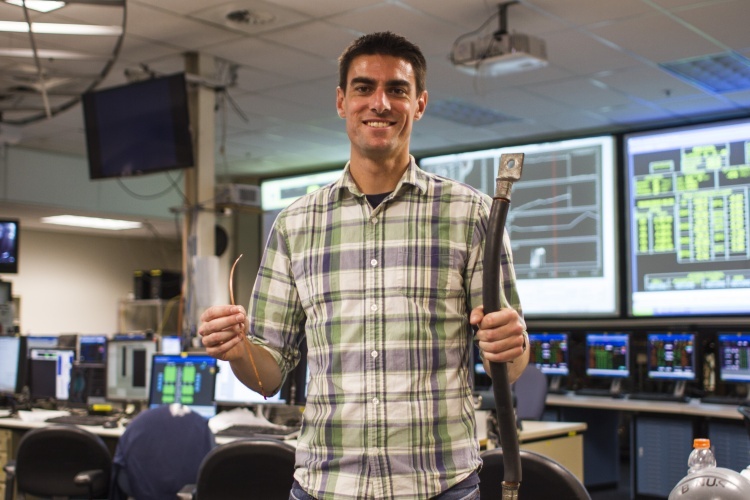 Brandon Sorbom, holding a REBCO tape and a conventional copper cable. REBCO can carry as much current as the copper cable when cooled with liquid nitrogen. Whyte and Sorbom believe that the ARC reactor should be able to produce three times as much energy as it takes to sustain the fusion reactor, and with further design refinements this ratio could be doubled; this would produce enough electricity for around 100,000 people. Devices of similar complexity have taken around five years to build, they add, meaning that a decade might be a realistic time-frame to build and test an ARC reactor. Now all we need is for Elon Musk to invest in the technology and we’ll have one sixth of the Avengers. This sounds a step nearer the modern alchemists dream of ‘room temperature Superconductors’. Let’s hope it works well enough to become commercial in a useful timescale. However… Have his left and right hands got mixed somehow. The thinner, and presumably the REBCO, cable is held in his right hand….